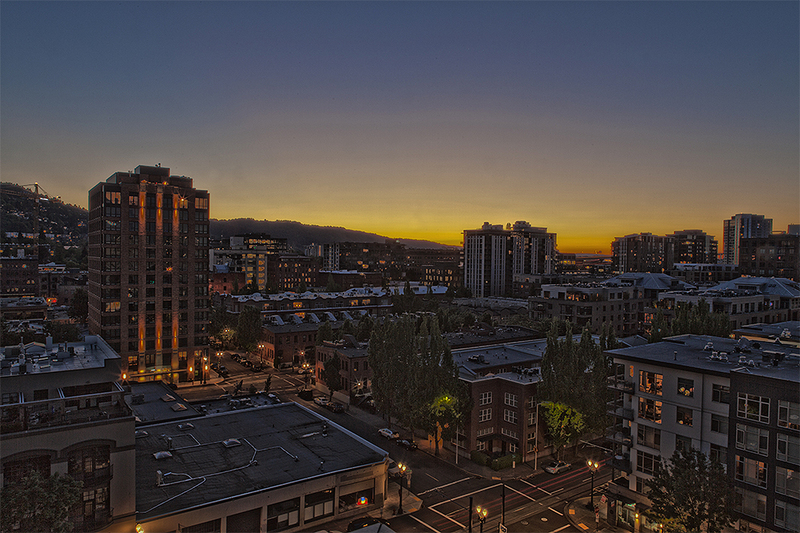 It’s not everyday that I get to photograph views from the balcony of one of Portland’s most beautifully architected buildings. 937 Glisan Street Condos, the 16-story LEED Platinum Certified highrise between 9th and 10th is more than the apple of my eye on a morning walk to Pearl Bakery. In fact, is, it has been lauded by Portland’s architectural and design God, Brian Libby, as “…one of the best highrise condo designs of its era”[Click for full article]. Whether it’s the fractal design of its cream brick exterior punctuated by sizable windows and vertical stacks of translucent red balconies, or its pioneering eye for residential sustainability, there are many elements of praise to throw at this 2008 design venture. Until recent years, Portland was a town of largely low and mid-rises. But burgeoning interest in our bushy beards, free range Thanksgiving turkeys, and poly dating scene has shifted that considerably. 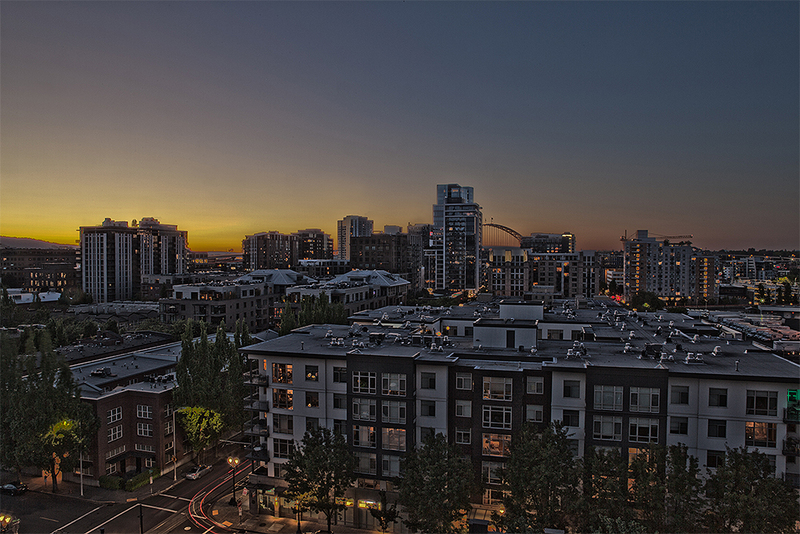 Due to the explosion of new construction, it’s increasingly rare to witness uninterrupted views. 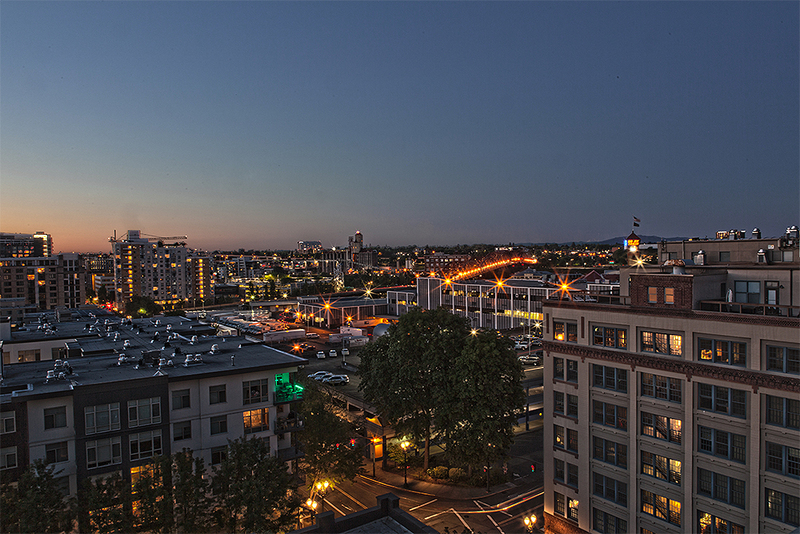 This particular condo, a 10th floor one-bedroom facing north onto Hoyt Street and beyond, treats balcony-going visitors to a veritable tour of Portland, all while sipping a red on the cleanly presented patio. 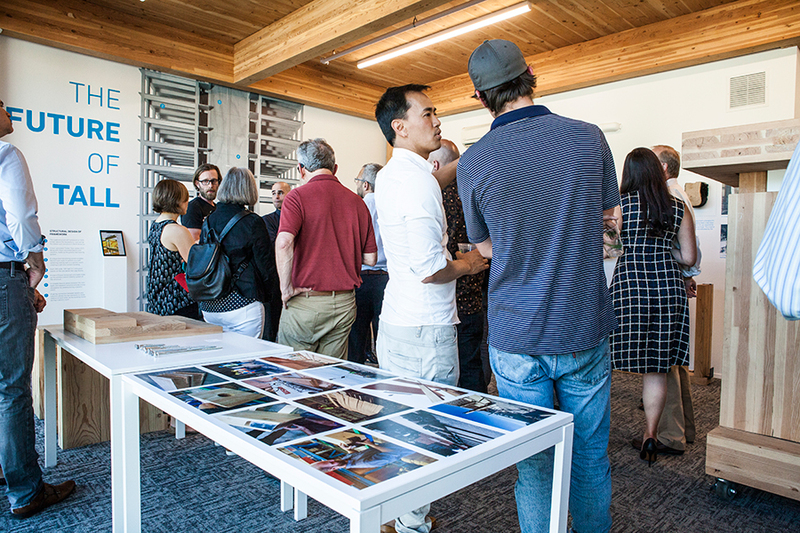 It boasts 180-degree views showcasing Portland icons. This western facing image captures the evening outline of the forested hills of Northwest Portland, where we flock to walk our furry friends, have a picnic, or just a good ‘ole convening-with-nature hike. In the lower elevations are the historic brick townhomes from the early 1900s on NW 11th Avenue. From these townhouses up to the half-moon arc of the famous St John’s bridge, this northerly view is by far the best for people watching, with its sea of lit home interiors. Perhaps a more “in” image of the Portland nightscape, here we see a touch of the central branch of the United States Postal Service here in town, whose not insignificant patch of land—14 acres!—will eventually be part of a significant revitalization effort. The string of Christmas lights is the Broadway Bridge, probably carrying one of a number of fans to a Trailblazers basketball game at the Moda Center. And then of course, there’s the pyramidal tower with a flag and memorable “Go By Train” sign marking Portland’s Union Station. An Amtrak train departing below can get you to Seattle in three and a half hours for $35. Perhaps it’s true of all cities, but to me, the nighttime views in Portland seed a rather unexpected romance, one that might otherwise be lost in our love of functional footwear and natural deodorants. We may not be a city of outstanding architecture or centuries-old history, but this shoot was a welcome reminder of the eclectic distinction that draws newcomers while anchoring residents. 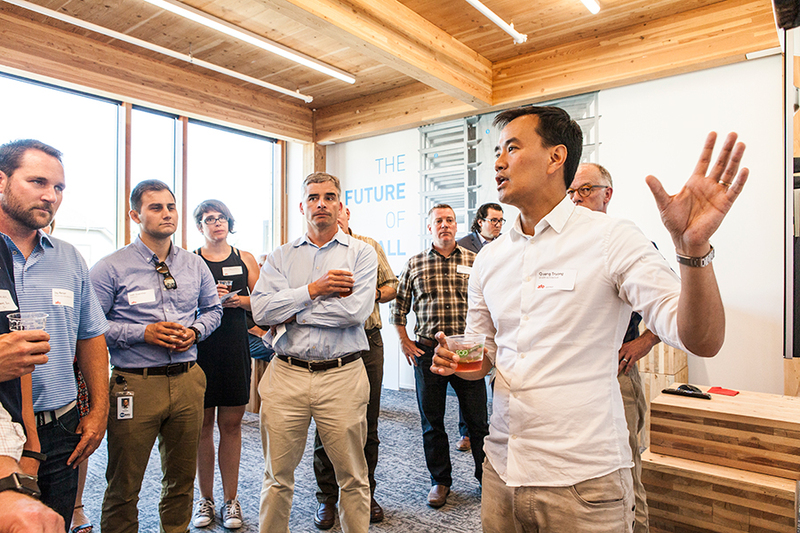 The Architecture Foundation of Oregon partnered with Lever Architecture to celebrate Albina Yard last week. A four-story, 16,000 square foot building, it houses Tanner Goods and The Wayback on the ground floor, with creative office space in the three stories above. 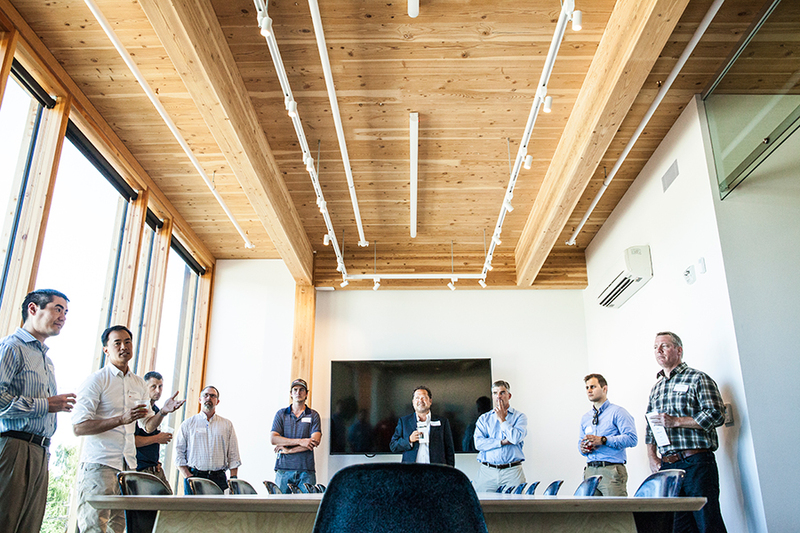 Opened roughly a year ago in September 2016, Albina Yard is the first office building in the country to use mass timber construction. 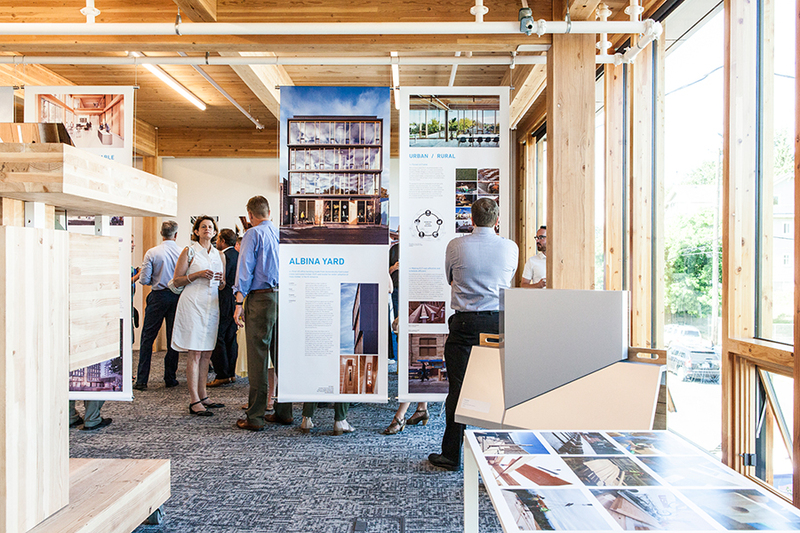 Lever Architecture, the company that designed the building and later relocated to it after founder and principal Thomas Robinson fell in love with its beautiful Mount Hood views, is well known for pioneering the use of Cross-Laminated Timber (CLT). 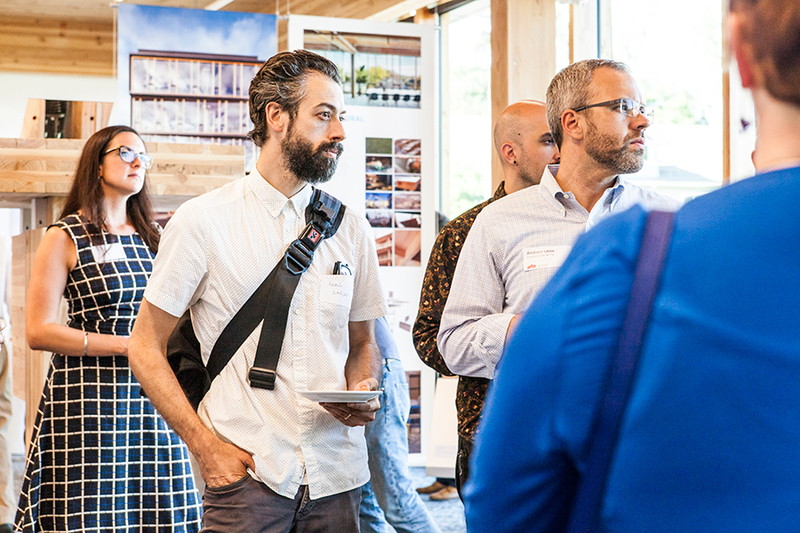 Their other high-profile CLT project, Framework, in Portland’s upscale Pearl District, is likely to become the first wood high-rise in the U.S. It will showcase ground floor retail space, five floors of office space and five floors of affordable housing. Cross-Laminated Timber or “CLT” refers to an engineered wood building system designed to complement light and heavy-timber framing designs. 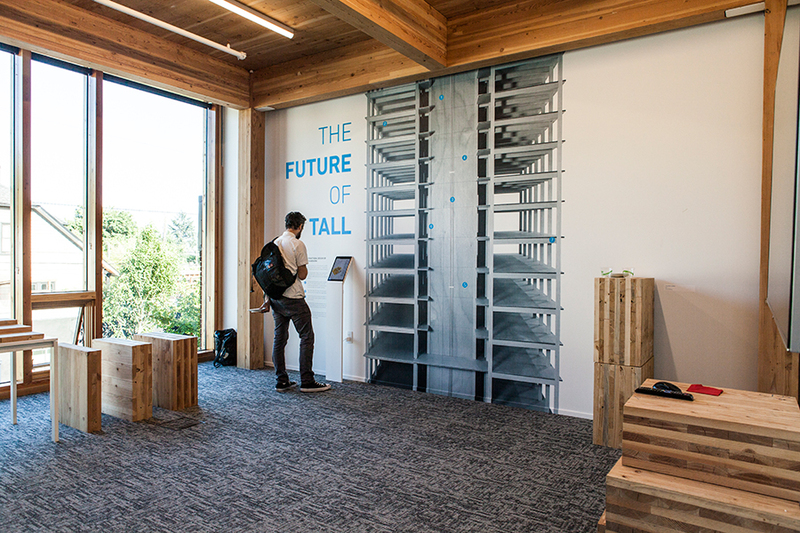 This system has many advantages over its steel and concrete competitors, such as strength, structural flexibility, lightness (75% lighter than concrete! ), and energy efficiency. The energy efficiency element of CLT buildings ranges from carbon sequestration—one cubic meter of wood stores one ton of carbon dioxide—to the prevention of air leakages and thermal gaps through its uniform paneling. In the case of Albina Yard, sourcing was yet another element with energy in mind: its timber frame and Douglas Fir CLT panels were all locally manufactured and prefabricated in Riddle, OR, just a few hours drive south of Portland. This front to end approach to sustainability in the built environment is part of what Robinson refers to as the “forest-to-frame” approach. 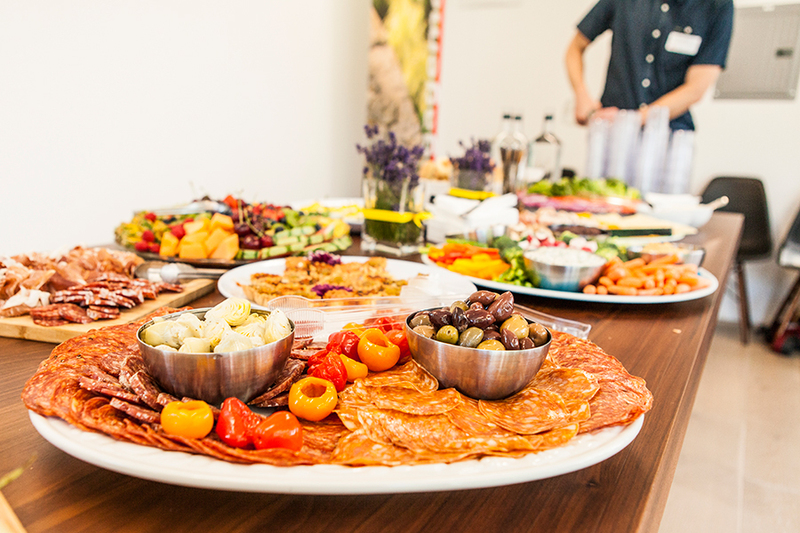 Akin to the farm-to-table movement of the culinary world, it aims to foster better relations between architects, contractors and timber suppliers. 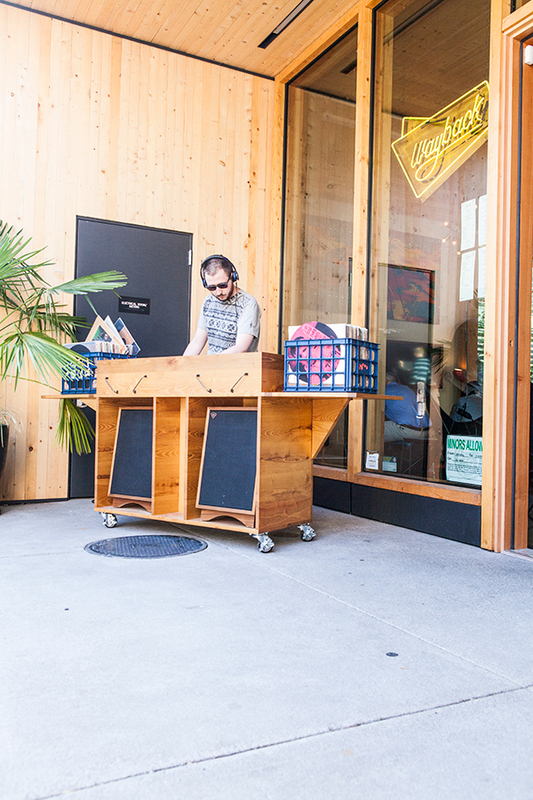 Speaking of good relations, The Wayback, one of the two businesses housed in the ground floor of Albina Yard, opened its doors to eventgoers looking to enjoy a cocktail and some artfully spun tunes. 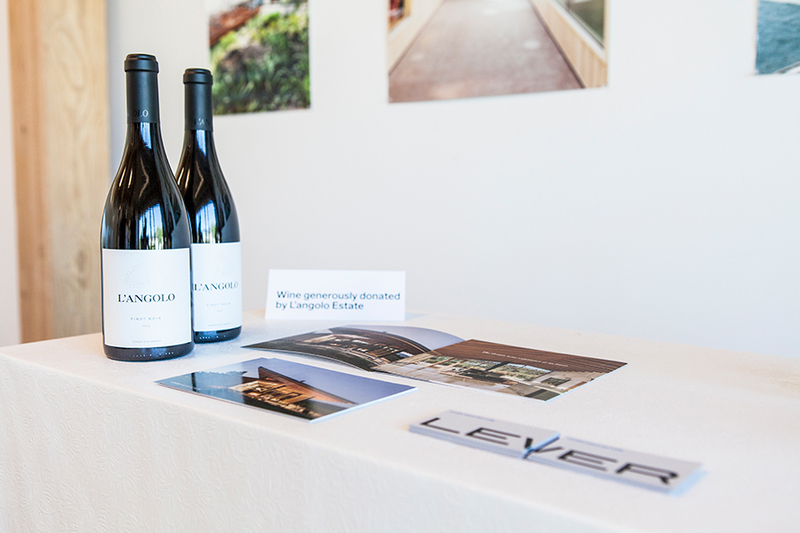 As with any successful event, the AFO and Lever arranged to have catered nibbles on all floors and complementary wine, provided by L’angolo Estate—another Lever project success. The saying goes, “April showers bring May flowers.” But judging by this beautiful morning last Saturday, we may have gotten it backwards! 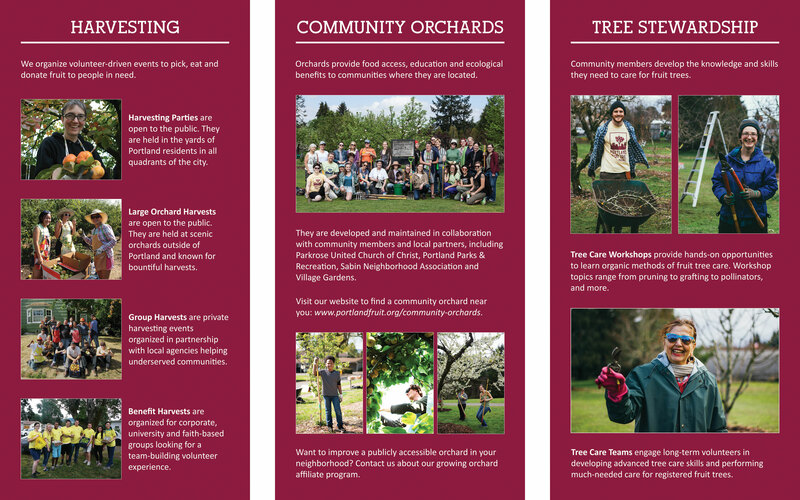 Portland Fruit Tree Project (PFTP) had a busy day organizing two related events at Green Thumb Community Orchard last Saturday, April 9th. In honor of of community orchards month, Green Thumb hosted two educational events focused on both fruit tree pruning and plantings. While pruning involves some smaller-scale tools, the work involved in preparing the soil and planting new growth in the orchard necessitated quite the selection of heavy duty rakes, pitchforks and shovels. 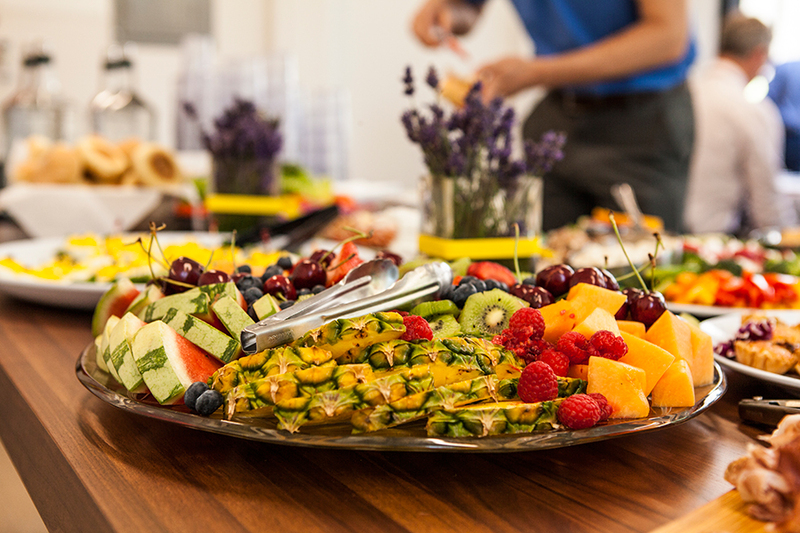 As with any event, Portland Fruit Tree Project asks all volunteers to sign in at the beginning of the event. This lovely lady pictured above was ready for some sun with her wide-brimmed hat. I couldn’t resist honoring her preparedness with a quick snapshot. The day’s events spanned three hours and two general subjects—pruning and planting—so it was important to corral everyone at the beginning to makes sure folks knew what to do and where to go. Long-time PFTP Program Manager, Bob Hatton, took a chunk of volunteers to the west side of the orchard, adjacent to the Brentwood-Darlington community orchard, to teach pruning techniques on the rows of espalier trees. The blossoms were so beautiful, even from afar, that I’d wager to say some volunteers may have had to fight moments of distraction during the pruning demonstration. One of my favorite parts of educational programming at PFTP, is how intergenerational it can become. Our regulars consist of parents and kids as much as they do parents and grandparents, and grandparents and grandchildren. There was a slight hitch in the plans for last Saturday’s programming, as a guest speaker was expected to attend, but volunteers just laughed it off. A few hours in the sunshine lightens the hearts of most. I love taking group photos at the end of community orchard events, because unlike PFTP’s harvesting events—which more often than not accommodate just a dozen or so people—the orchard session have virtually no limit on attendance. It’s amazing to see nearly thirty people get together on their Saturday to work together in the dirt. I recently wrapped up freelance work with one of my favorite clients, Tobin Dane. 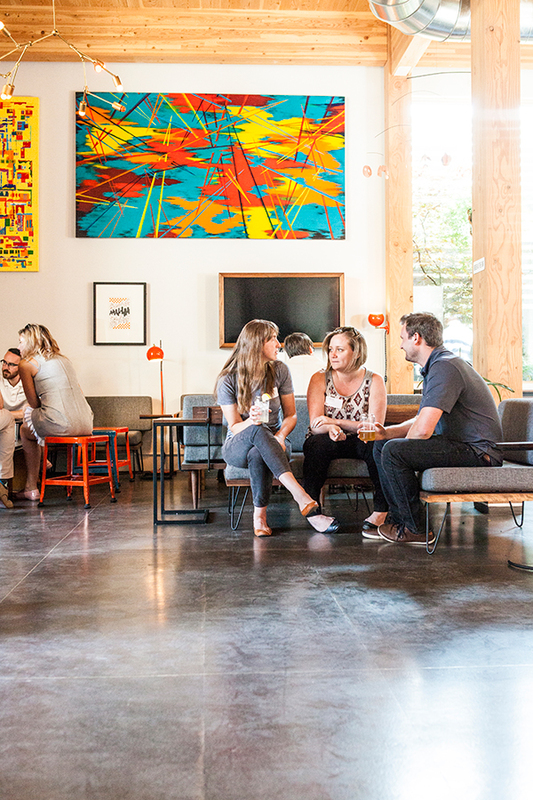 A small but mighty operation in a trendy office space sporting colorful murals and industrial chic shelving by Portland-based artists, Tobin Dane creates start-up companies in a wide variety of industries. Since moving to Portland, owner and founder Tobin Goodgame has focused business on concepts that concern many city natives, space being one of them. According to Metro News and the U.S. Census Bureau, our fair city was the 15th fastest growing large metropolitan area in the country from 2013-2014. We are also a hub for entrepreneurs and startup companies. This then begs the question: when space is at a premium, where do we live and work? In answer to this anxiety-inducing question, Tobin Dane created Edison Box: a startup that creates custom live-work-play spaces for the sustainably-minded urbanite. These space are made from upcycled shipping containers that are insulated, wired, and delightfully plug-and-play upon arrival. They come in different sizes to meet your various needs. It was clear from the get-go, that we were going to need a full-service design agency to properly brand and deliver the message of Edison Box. To that end, I whipped something up to pitch the idea to the likes of Cinco, Sincerely Truman and other talented folks like that. The dimensions in which we exist and move. The distance between two points. A period of time. An (in)finite element that shapes each one of our lives. Space influences our days and nights, our work and play, our movement and our stillness. From space, our hopes and dreams, aspirations and genius are seeded and determined. But like any garment fit to flatter, space is the individual’s domain. That which inspires one mind may dull another. That which fulfills one mission may fail in another. We’ve come to revere the force of space, to acknowledge its place in the creative process. That’s why we’ve dedicated years of exploration and (de)construction to the design of custom space solutions, physical structures of your essence manifest, that ignite innovation and empower your reach like never before. Last fall a lovely family from the Los Angeles area approached me to design a website for their son’s bar mitzvah over the 2016 Presidents’ Day Weekend. They were so darn friendly and excited to save on paper, I quite happily agreed. To add cherries to sundaes, my good friend and mentor, Tamara, of Tamara Leigh Photography was in charge of head shots for their dapper tween, so there was no question that I’d have a selection of stunning photography to consider in my design efforts. The client and I wanted an economy website with short-term and ad-free potential, that was youthfully playful yet clean. After reviewing some custom and template avenues, we ended up choosing this Wix wedding site template. “Wedding?” you ask? Yep! But with a few changes in color and content, I came out with something a little different for Saben (the star of this website and the weekend festivities). I kept the homepage (above) fairly simple and pattern-free, especially considering our choice of photo, which already boasts some geometric wall design. Drawing inspiration from the app culture of today, I decided to make most of the site buttons a simple monochromatic circle with a self-explanatory icon centered within. Each of the icons linked to the appropriate subpage of each menu button. Like many big occasions, this one had to accommodate some local and out of town guests, some very close family members and some friends, so I made a couple of dropdowns to indicate the events available to each. Friday night “shabbat” dinner was an event for everyone, and so merited a handy dandy interactive map. I couldn’t resist this one. It’s odd, but so many of my own out of town guests during my years in LA never thought to bring more than flip flops and shorts. But like any desert, temperatures can actually drop quite a bit at night despite the warm days. And of course, I would be remiss if I did not include some tips for the most important consideration of an LA visit: transportation. The rise of Uber made for a fourth option and a delightfully distinct icon for inclusion on this page. Overall, I was quite pleased with the user-friendliness and customization options of the Wix template process. My previous sites were built in WordPress and Blu Domain, so this was an exciting opportunity to expand my horizons in site template platforms.